A boyfriend jean of a different feather, for effortless summertime styling! Hey everyone, it’s Lana here…ready to take a quick break from my usual skinny jeans today! Skinnies go with everything, and are my absolute favorite since they go so well through all seasons, but when the warm sweaty weather hits sometimes it’s nice to slip into something a little more relaxed and comfortable, like a boyfriend jean! The boyfriend jean has made its round through the fashion world for the last few years, and I believe it was first made popular when Katie Holmes was seen wearing Tom Cruise’s rolled up jeans while out on the town a few times! 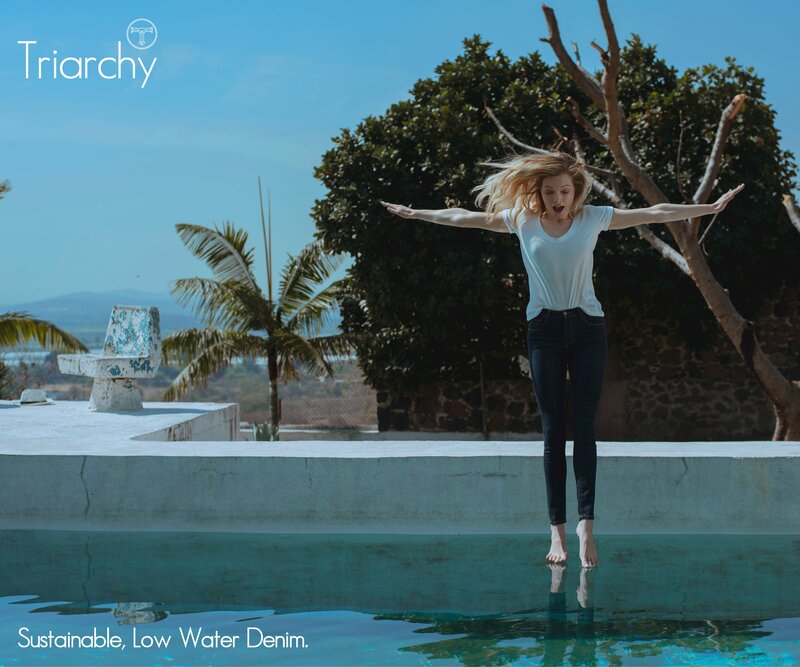 I own a nice comfy pair that Rich & Skinny came out with shortly after when the style was still in its infancy, and now it’s pretty much a staple style that just about every denim brand has in its collection. I was introduced to Standards & Practices recently and I chose a beautiful relaxed pair to switch things up a bit here in my reviews, so here is a Standards & Practices Ex Boyfriend in Hurricane review! Standards & Practices is a truly different brand, and I had a hard time deciding on what would make a good review for Denimology. There were a lot of good choices! For the fall, the brand is releasing some fresh styles such as Indigo knit, Indigo french terry, lightweight Indigo chambray, quilted knit and even Vegan leather, in the form of skirts, dresses, jeans, outerwear and tops! The Ex-boyfriend jean in Hurricane struck me as something truly different. 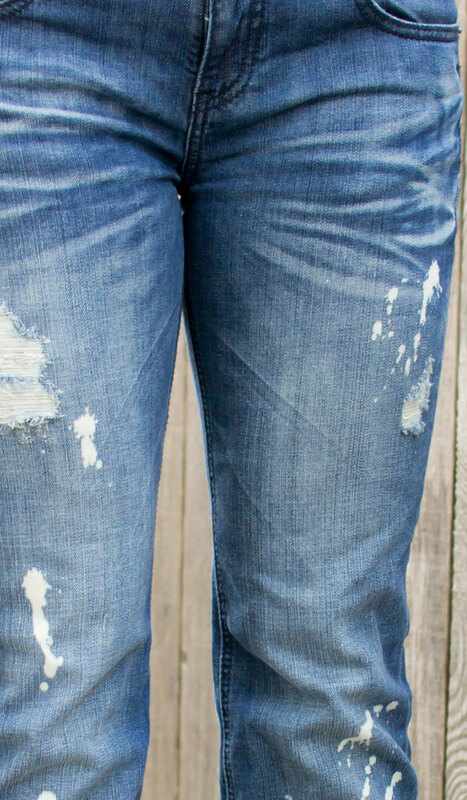 It’s not only a fitted yet relaxed version of the boyfriend trend, but also is a pretty vibrant blue, whiskered and faded wash that’s decorated with well-placed bleach splash marks and distressing on the thighs and on the left leg below the knee. As soon as I had it in my hands I knew it was something special! I am usually very picky about slouchy jeans since my shape isn’t always flattered very well by them. I had these sent in my usual size 26, and the fit was perfect, and very comfortable! The waistband is a 8.5″ midrise and is tight enough so they sit on my hips without the need for a belt, but slouch a little bit so they actually feel more low-rise than anything. The fly itself is only about 2 inches! These jeans loosely hug my hips and thighs, while being relaxed from the knees down to a cropped, cuffed 29″ inseam. The cuffs aren’t sewn in, so you can uncuff them if you’d like, but I don’t feel a need to. I love the way they look! At 98% cotton and 2% spandex, they didn’t really stretch out after a few wears, but softened up a bit to become even more comfortable. I think the vibrant blue whiskering and fading featured on these jeans, along with the fit, do a really good job at making these look more flattering than a typical boyfriend jean does! There is also some super cute whiskering at the back of the knees, and the Standards & Practices logo is included on a rugged looking leather strip that’s sewn in on the usual back-right location on the waistband. 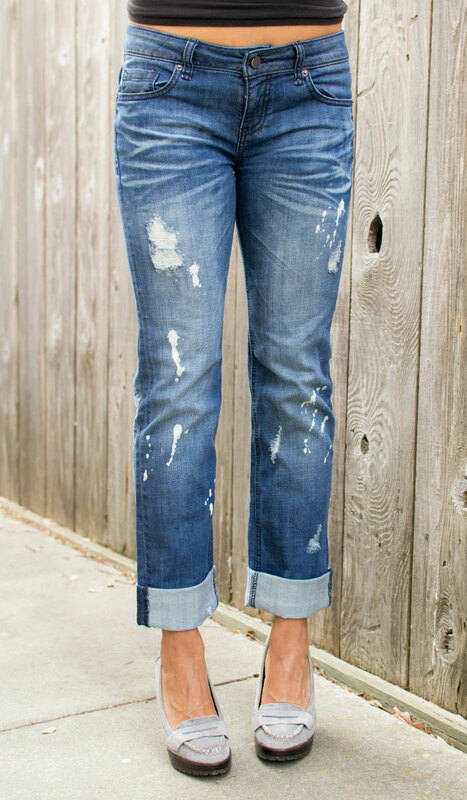 The Standards & Practices Ex Boyfriend in Hurricane is such an awesome boyfriend jean! 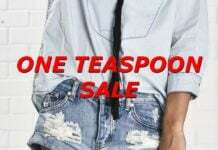 It is perfect for summer, when we want to wear less but still flaunt a bit of edge in our otherwise-simple outfits. When I’m styling anything relaxed, I always pair it with something tight. For example, when styling boyfriend jeans, I always wear a tight top to avoid looking frumpy (and if I have a loose top, out come the skinny jeans). I also think boyfriend jeans look great with heels, to keep your legs looking long since cuffed styles often seem to have a shortening effect (not that I’d really care while strolling along the beach though)! With that said, I think the strong whiskering, distressing and bleach marks make looking stylish a lot easier, since now I can bust out all of my boy beater tanks that have been sitting in my closet just waiting for the sun to start showing its brighter side, without feeling like I just threw something together without a care. Hey, us fashion bloggers always have to stay up on our game after all! You never know when you might encounter a photo-friendly moment, right? All Standards & Practices jeans are under $100, so you can be sure to grab something you will like from the brand while keeping some of your hard-earned cash free for everything else that the summer months have to offer. Check out the recent Denimology post featuring the Standards & Practices F/W 2014 lookbook for more photos of these sweet looking jeans! Purchase a pair for yourself, right here. Psssst ! All denim are ” boyfriend Jeans ” ! see the history of jeans .